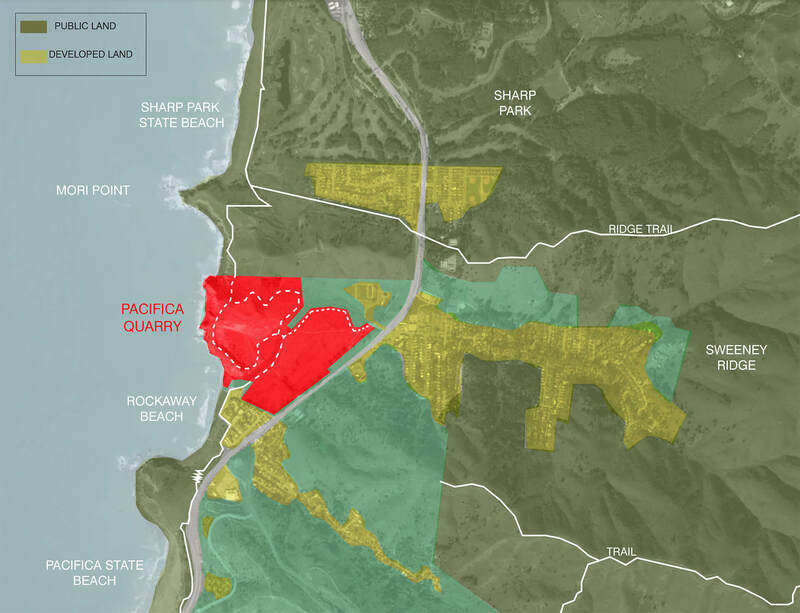 Located along Pacifica’s spectacular coast, the Quarry encompasses 86 privately owned acres within the City. 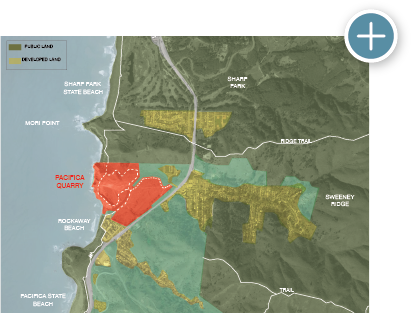 It forms a “missing piece” of a larger coastal open space system, including Rockaway State Beach to the south and Mori Point to the north. The Quarry can provide critical connections and a permanent open space buffer; site restoration, however, will require extensive grading for mining reclamation, wetlands and creek enhancement, and improvements to trails. Limited and sensitive redevelopment of the site, subject to voter approval, will finance this restoration. Quarry restoration and reuse entails an extensive and public process of permits, studies, and approvals. Two hundred years of mining, followed by decades of neglect, have left behind unstable slopes and rapidly spreading invasive species such as pampas grass. Responsible restoration calls for thoughtful planning and significant investment to reestablish a sustainable, healthy site. Committed to stewardship and development of high quality, safe environments for communities. PROPERTY OWNERS Preserve@Pacifica, LLC purchased the quarry property in 2014 with a commitment to undertake a sensitive balance of restoration and site-appropriate development. Eenhoorn, LLC, a property management company based in Grand Rapids, Michigan, represents the quarry property owners. Founded in 1988 by the father-son team of Carl and Paul Heule, Eenhoorn subscribes to a balanced, long-term investment strategy for managing a select international portfolio of residential and commercial properties. They are committed to being good stewards of the earth while providing high quality, safe environments for people to work, play and live in, from affordable housing to Class A high-rise apartments. Eenhoorn believes that successful communities emerge from thoughtful design solutions, quality construction, and collaboration with all stakeholders. The company is recognized by institutional lenders and sellers as being innovative problem-solvers for complex development projects such as The Quarry, for which their local team of experts is undertaking careful studies to prepare an environmentally sensitive, long range plan. Click below for more.